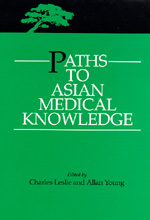 Like its classic predecessor, Asian Medical Systems, Paths to Asian Medical Knowledge significantly expands the study of Asian medicine. These essays ask how patients and practitioners know what they know—what evidence of disease or health they consider convincing and what cultural traditions and symbols guide their thinking. Whether discussing Japanese anatomy texts, Islamic humoralism, Ayurvedic clinical practice, or a variety of other subjects, the authors offer an exciting range of information and suggest new theoretical avenues for medical anthropology.